The Gunners have been keeping a close watch on the Ivorian's performances this term where he has notched 17 goals and 10 assists across all competitions. In recent months, there has been speculation claiming that the club could make a summer approach for the attacker, but according to BeIN Sports, Bayern have leapfrogged them in the player's pursuit. It is added that the German champions have lodged a permanent offer to sign Pepe and they are confident of pushing through an agreement ahead of the summer. Arsenal currently have a restricted £45m budget to work with for the summer transfer window and this appears likely to put them off from making an offer to sign Pepe. 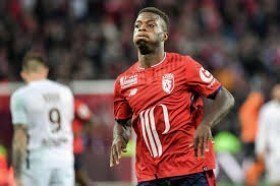 Pepe, who was formerly in the ranks of Angers, is currently valued by Lille at around £69m. The French club have previously confirmed that they have turned down offers worth £50m from English clubs.